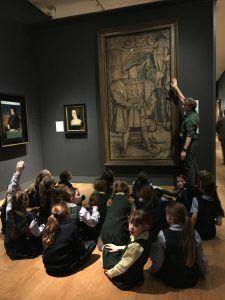 Year 4 travelled to The National Portrait Gallery this week to get our ‘heads stuck into the Tudors’, our favourite subject! The Gallery has over 200,000 portraits from the Tudors to the present day. Marc explained to us about some of the different portraits in the Tudor room. One of the portraits was sadly damaged in a fire and only half of it survived. He was surprised and delighted at the amount of knowledge that we knew. We enjoyed the chat because he told us some new things and we shared some interesting facts that we knew too. 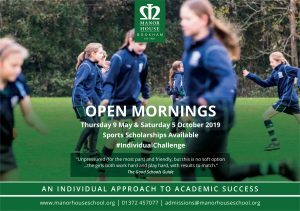 Mrs Darlington challenged us to ask Marc questions that would give us extra information. It was a Tudortastic trip! You were a fabulous leader and we appreciated you including us in your conversations. It was extremely enjoyable. We were thrilled with all your glorious facts and we hope we helped you to learn something from us too. These are two amazing facts that fascinated us, with a gasp! We learnt that Queen Elizabeth I accidentally poisoned herself using white make up. She became bald! The locket ring was very fragile and it had a picture of Anne Boleyn in it. Elizabeth I wore the ring because she missed her Mum who was beheaded by her Dad, Henry VIII. Thank you for the wonderful tour. It was awesome. Abigail, Daisy H, Emily, Fleur and Sammie. 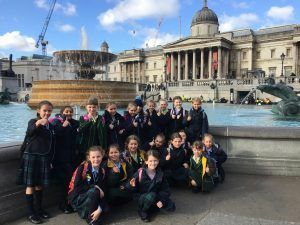 Year 4 girls in Trafalgar Square. Year 4 girls learning about a Henry VIII portrait.